Following the Public Health Act of 1848 inspectors were sent to many towns to report on the sanitary conditions of the inhabitants. George Thomas Clark visited Penzance between the 10th and 13th February 1849, holding public meetings to collect evidence and personally inspecting the town. He made his preliminary report on 20th February 1849. 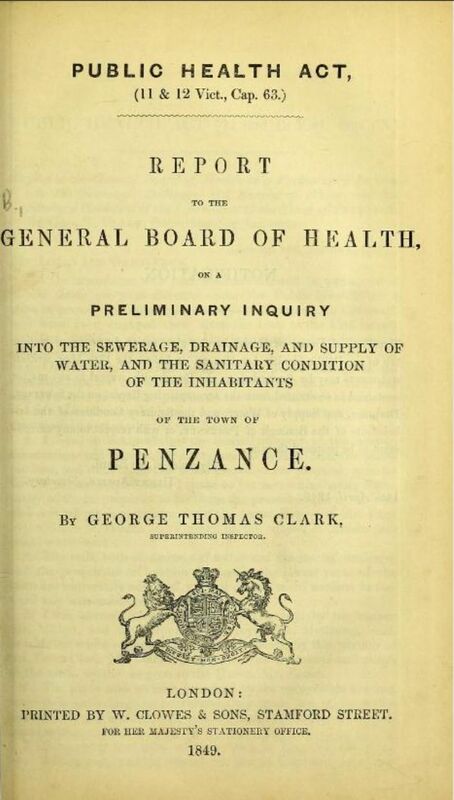 Clark described Penzance as being in one of the most beautiful positions “upon a bay proverbial for its salubrity and beauty” yet stated that “It would be difficult to find a spot so foul in which life is so seriously affected “– the sickness and mortality caused by dysentery had been excessive in his judgement. His described those parts of the town “remarkable for their filth and want of drainage.” He highlighted the older, lowest and more densely peopled parts of the town near the battery bathing place, pier and quay where lack of space meant that privies and often cess pools were under the roof of the house and people living on upper floors regularly discharged all filth by an open chute directly into the street or into the harbour above the tide level. The low ground behind the Esplanade and Marine Terrace was another area of dirt, damp and sickness with the privies, cess pools, piggeries and open gutters lying on low marshy soil that was not naturally drained. St Clare Street, St Clare Terrace and Pendarves Row, all higher than the water supply, had houses arranged in small courts that were close together, unpaved and without drains but with an open irregular gutter about a yard from the back door of each house. Clark described the slaughter houses and piggeries in many yards adding to the contents of cess pools, privies and blocked gutters and the unpaved alleys leading to the backs of these houses used “by the people as public necessaries” as the town was “very insufficiently provided with necessaries” or toilets. Clark commented on the open stagnant ditches near public walks and footpaths, on fish and vegetable markets still held in the public streets despite the provision of covered rooms and on the lack of paved streets (apart from the main street) even though cheap and good material for paving was readily available. He noted the heavy losses from fire which an efficient water supply would probably have saved but “the want of water is …severely felt” with the town’s reservoir being below the higher part of town. Construction of two sewerage outfalls into the sea at Alverton and Chyandour, or if desirable, using the sewerage to manure land towards Newlyn. Laying of pipe-drains from each house and yard into an adjacent main sewer. Cess pools to be declared “nuisances” and filled in. The text of the full report into sanitary conditions in Penzance is available here.